Sunny. High 74F. NNW winds shifting to SSW at 10 to 15 mph.. 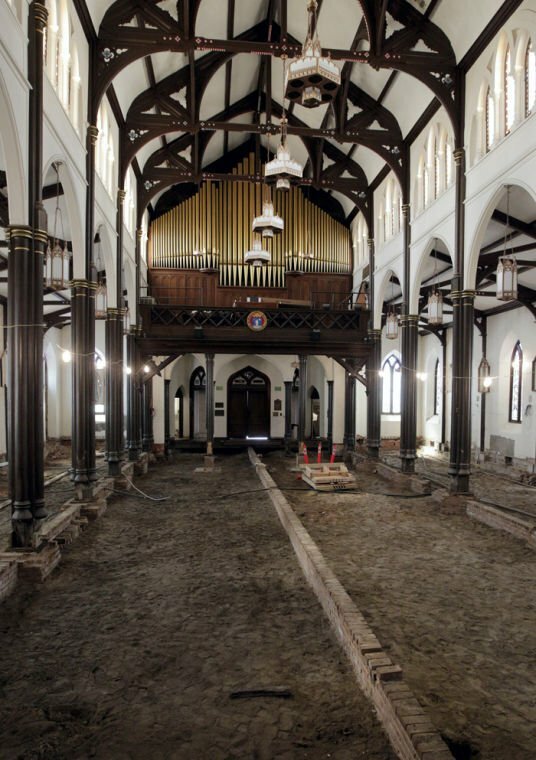 The floor has been removed from the 166-year-old St. Mary’s Cathedral Basilica in Galveston as part of a $3 million restoration project to repair damage from Hurricane Ike. Father Joseph Limanni hopes the restoration will be complete in time for Easter 2014. The floor has been removed from the 166-year-old St. Mary’s Cathedral Basilica in Galveston as part of a $3 million restoration project to repair damage from Hurricane Ike. The Rev. Joseph Limanni, a one-time engineer, said he hopes the restoration will be complete for Easter 2014. Signs and monuments have been saved from the 166-year-old St. Mary’s Cathedral Basilica in Galveston as part of a $3 million restoration project to repair damage from Hurricane Ike. The Rev. Joseph Limanni talks about the extensive work being done inside the 166-year-old St. Mary’s Cathedral Basilica in Galveston during a $2.6 million restoration project to repair damage from Hurricane Ike. Limanni hopes the work will be complete in time for Easter 2014. A white board indicating the musical selections for the last service held before Hurricane Ike in September 2008 still sits in the choir loft at Galveston's 166-year-old St. Mary's Cathedral Basilica. 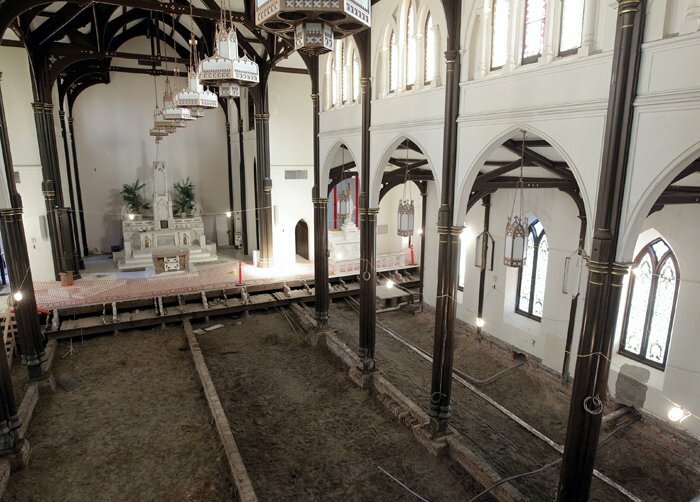 The floor has been removed from the 166-year-old St. Mary’s Cathedral Basilica in Galveston as part of a $3 million restoration project to repair damage from Hurricane Ike. The Rev. Joseph Limanni hopes the restoration will be complete in time for Easter 2014. The Rev. Joseph Limanni shows where layers of paint are flaking away inside the 166-year-old St. Mary’s Cathedral Basilica in Galveston during a $2.6 million restoration project to repair damage from Hurricane Ike. Original painted wood was exposed in the 166-year-old St. Mary’s Cathedral Basilica in Galveston during a $2.6 million restoration project to repair damage from Hurricane Ike. The Rev. Joseph Limanni hopes the restoration will be complete in time for Easter 2014. The exterior of the 166-year-old St. Mary’s Cathedral Basilica in Galveston has been repaired and weatherproofed as part of a $2.6 million restoration project to repair damage from Hurricane Ike. Sunlight shines through a stained glass window in the 166-year-old St. Mary’s Cathedral Basilica in Galveston as a $2.6 million restoration project to repair damage from Hurricane Ike is under way. The Rev. Joseph Limanni easily lifts a support brick from its mortar inside the 166-year-old St. Mary’s Cathedral Basilica in Galveston during a $2.6 million restoration project to repair damage from Hurricane Ike. GALVESTON — The Rev. Joe Limanni would never consider himself a miracle worker, but the task he’s been charged with will be no small feat. The engineer-turned-priest is overseeing the resurrection of St. Mary’s Cathedral Basilica, considered the birthplace of the Roman Catholic faith in Texas. The 166-year-old church at 21st and Church streets on Galveston’s East End was not in the best shape before Hurricane Ike pushed about 5 feet of water into the sanctuary. It survived the Civil War, the 1900 storm, the 1915 hurricane, hurricanes Carla, Alicia, Rita and other storms, hungry termites and the harsh elements. But for a time, it appeared Hurricane Ike would do the Mother Church of Texas in for good. Limanni was appointed by the Galveston-Houston Archdiocese to oversee the repairs, reconstruction and enhancements to the venerable church. The restoration will cost more than $3 million and could cost more as “any unforeseen problems arise,” Limanni said. In addition to money from the archdiocese, the church is seeking donations to fund the restoration. The first order of business was to replace the aged and patchwork roof and to seal the exterior walls against the elements. That took place last summer, along with a new paint job with elastic paint that helps keep moisture out but allows the building “to breath,” Limanni said. The focus now is on the interior, where the wooden floors have been pulled up, exposing bricks laid in 1847 that had been the supports. Galveston architect Michael Gaertner said the plans call for a concrete floor that will be four inches thick so that the church can better weather future storms. The floor will also be raised to match with the steps to the main altar. Limanni, who produced the computer-generated drawings of the restoration work himself, also envisions three Renaissance-inspired murals that would hang on the walls behind the altars. Those will be expensive and will require extra funds since they are not part of the original budget. With each step of the restoration process, those working on the restoration find interesting parts of history. Behind the white-painted panels that make up the interior walls of the church are the original wood walls, which were painted with church and biblical symbols but were covered up during a 1970s restoration. When the work is done, those painted walls will once again be hidden from public view. The view from the choir loft, where the Pilcher pipe organ that was installed in 1922 still works and a white board still has the list of songs that were to be played the Sunday Ike struck, gives a better perspective of the task ahead. The pews have been refurbished and sit in a building next door, as do the statues that adorned the side altars. The Stations of the Cross have also been restored and are awaiting their return to the worship center. The towers at the front of the church are being secured with steel braces and rods. The foundation will be stabilized so that water will no longer saturate the ground level of the church and “rise up into the walls.” The plaster-covered walls will be repainted, and there is still some plumbing and electric work to be done. The statue of the Virgin Mary atop the Basilica, which local legend points to as a symbol of the island’s survival after the 1900 storm, will need to be cleaned. The cardinal’s cathedra, also known as the bishop’s throne, will also be returned. And should Pope Francis ever decide to visit Galveston, he’ll have an area, which Limanni referred to as “the Pope’s corner,” that, by church rules, must be at the ready. Once the restoration is complete, the basilica will be used for special masses and “hallmark events,” archdiocese spokeswoman Catherine Rogan said. Limanni was hesitant to predict when the project would be done. A fitting time to celebrate another type of resurrection. • In 1845, Bishop Jean Mane Odin received a donation of 500,000 Belgian bricks that had been shipped from Antwerp that would be used to build the church. • In 1847, Pope Pius IX named St. Mary’s Cathedral as “the mother church” of the newly established Catholic Diocese of Galveston, the only diocese in the state at the time. Architect Theodore E. Giraud designed St. Mary’s. • In 1848, the church was dedicated. • In 1877, the church’s bell tower was constructed. • In 1900, the church was one of the Galveston landmarks to survive The Great Storm. • In 1907, stained glass windows were installed to mark the church’s 60th anniversary and mark Bishop Nicholas Gallagher’s 25th anniversary as the bishop of the Galveston diocese. • In 1929, crews built the church rectory. • In 1968, the cathedral was named to the National Register of Historic Places. • In 1979, Pope John Paul II elevated the cathedral to a “Minor Basilica,” an honor given to select churches because of their antiquity or historical importance. Contact Mainland Editor T.J. Aulds at 409-683-5334 or tjaulds@galvnews.com. In a fundraising effort, proceeds from the novel Queen of the Waves by Lisa M. Bossier are going to St. Mary's Restoration Fund. The novel is available at Amazon.com and most book stores. The author was recently featured in a book signing event at Galveston Bookshop.